Connected technologies have revolutionized modern life in countless ways, and they are now starting to change the way cities work. The “smart city” movement is gaining traction worldwide, and it’s opened up a new world of possibilities to forward-thinking municipal planners. Transportation demand management (TDM) is a key part in the emergence of smart city strategy and smart mobility around the world. The role of technology is expected to increase as ICTs continue to be integrated in cities in novel ways. With the rise of the sharing economy, new modes, and a variety of app-based mobility services, people have more choices for getting around than ever before. The challenge for planners and large employers is to optimize efficiency, and help commuters make sense of and use these new choices in safe, sustainable ways. While smart mobility often relies on technology, it is critical to develop and implement thoughtful programs and policy to support it. With those factors in mind, let’s explore a few emerging concepts around smart mobility and smart transportation. Smart cities are born at the municipal planning level, when city officials make a financial and philosophical commitment to building one. Specific to TDM, some examples of high-impact smart transportation policies include concepts like congestion pricing, demand-based parking fees, low-emission zones, and toll lanes on roads and highways. Congestion pricing is a strategy that sees drivers and public transit users pay a premium to access roads and services at peak times. In theory, it provides a strong disincentive for joining the traffic fray during high-volume periods, which in turn reduces congestion and crowding while facilitating the smoother flow of traffic. Similarly, demand-based parking fees are designed to maximize both space usage and availability. Low-emission zones are becoming popular in European cities. They are designed to restrict or prevent the entry of high-pollution vehicles to low-emission urban areas, thus cutting pollution and improving local air quality. In North America and elsewhere, toll lanes are appearing with greater frequency. Several different toll models are used, with one of the most common requiring drivers to pay to use express highway lanes. Vehicles carrying a certain minimum number of passengers can be exempted from the fee, providing a financial motivation for carpooling. There are many other examples of such policies. For instance, some cities use license plate restrictions to limit vehicle use on certain days, while others use entry regulations to cut vehicle volumes and traffic congestion. Connected sensors, known as the Internet of Things (IoT) can provide valuable data to city planners. Supported by smart programs, data from IoT can be used to further improve traffic flow and service performance. Connected devices in the IoT include the smart phones and other personal devices many of us use and carry around every day. These connected devices offer incredible opportunities to planners and other agencies. Though still emerging, the connected vehicle environment is an important example. Vehicle-to-infrastructure: This strategy connects the vehicle to traffic infrastructure, which can relay information about traffic conditions and the presence of potential delays or hazards. Vehicle-to-vehicle: Cars and trucks can be configured to bounce data between one another in the interests of avoiding accidents and reducing congestion. Vehicle-to-the-cloud: Connecting a vehicle to the cloud facilitates the instantaneous delivery of a wealth of information about everything from traffic conditions and alternative routes to fuel stations and available services and retail locations. Vehicle-to-pedestrian: In the near future, some experts think it will be common for cars and trucks to be connected to pedestrians through their smartphones. This has great potential to improve pedestrian safety. It may also offer new mobility options. Vehicle-to-everything: In time, a comprehensive connectivity model will likely emerge, in which vehicles are connected to all of the above. Smart cities take even greater advantage of these networks of connected sensors to collect data about the city. Planners can use these data to gain insights that help them improve infrastructure, city services, and energy efficiency. Agencies can also use IoT devices to engage and communicate with the commuters, directly or via the networks they already participate in. 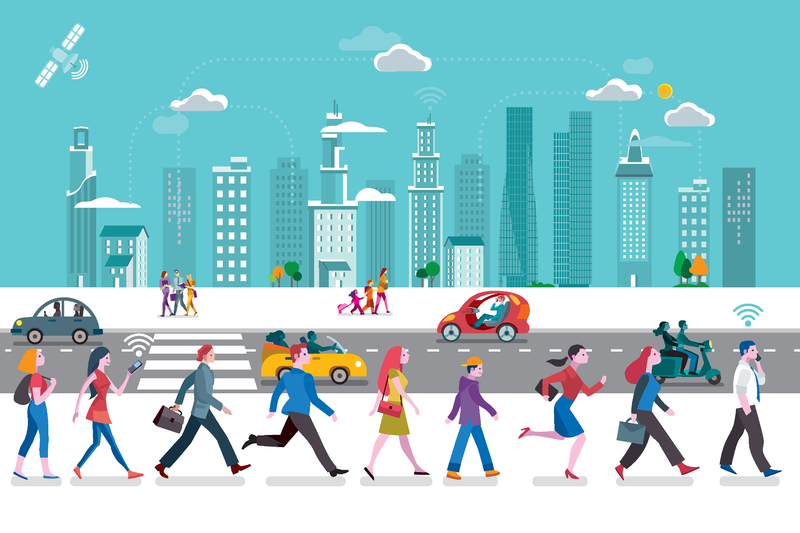 Smart cities are making IoT a key part of their workforce mobility and TDM strategies. They do this by connecting commuters in trusted organizational networks, via their employers, universities, or other affiliations. Networks like these allow commuters to discover information to help them get to work efficiently. They also enable commuters to share relevant data about their trips with their employers and government directly from their connected smartphone, without the friction of logging trips or completing surveys. Smart TDM strategies leverage the capabilities of IoT to both collect data and engage with the public in these important ways. By engaging commuters directly and through their organizations, agencies can gain insights, offer better options and incentivize alternative patterns—all to the benefit of regional workforce mobility. Planners are already using connected technologies to optimize traffic flow, largely through the increased use of next-generation smart traffic lights. These traffic control systems enable lights to synchronize more efficiently during peak periods by altering their sequences and phase timings to meet condition-specific demands. Lights stay green on high-volume roads for longer periods, rather than using pre-set color phase timings that contribute to congestion and inefficiency. Reducing passenger wait times and keeping traffic moving efficiently are two of the primary goals of smart public transportation for surface-level vehicles. These approaches to smart transportation use a combination of GPS tracking and GSM/GRPS connectivity to relay real-time data to passengers, allowing them to plan their journeys with pinpoint, up-to-the-minute precision. Advanced transponders can also communicate with traffic lights, allowing buses and streetcars to relay signals that keep lights green when they would otherwise turn red. In subways, for example, transit agencies can use smart transportation technology to improve ticketing models and access to route information. They can also enable passengers to remain connected and productive during their journeys. This is only the beginning of what’s possible for transportation in smart cities. Technology and programs that integrate commute trip reduction and mobility aggregation will continue to have major influence on smart mobility. When cities connect employers and commuters to the possibilities of modern mobility, they can enhance economic opportunity, sustainability, and safety for their constituents and visitors. To get a glimpse of the future for your city, get started with a demo of smart transportation tools and programs from RideAmigos.